Unpredictable weather ahead? The Thylacine adapts to every climate. Variable Warmth Technology™ and CustomFit™ adjustments give you full control over temperature and fit. With an optional liner for additional warmth, you’ll be set all year round. Keep your phone or headlamp always within reach. Cinch down the bag to suit your sleeping preferences. Wide and roomy or slim and snug. A cube for your feet. Plenty of room, keep them warm. Stash your jacket, pillow, a rabbit...anything goes. Never lose your pillow again to the depths of your sleeping bag. Down or synthetic, our insulation stays dry and warm through water, rain, sweat or snow. Insotect regulates an even distribution of warmth to keep you at optimal toastiness, throughout the entire bag. In other words, no more waking up to cold spots. The Thylacine was named Gear of the Year in Outside Magazine's 2017 Buyer's Guide. The Thylacine won over Outside's editorial team with its fully customizable capabilities, functional design, lightweight fabric, and durable hardware. Feel the difference. This fabric is strong, windproof, washable, and silky-soft to the touch. 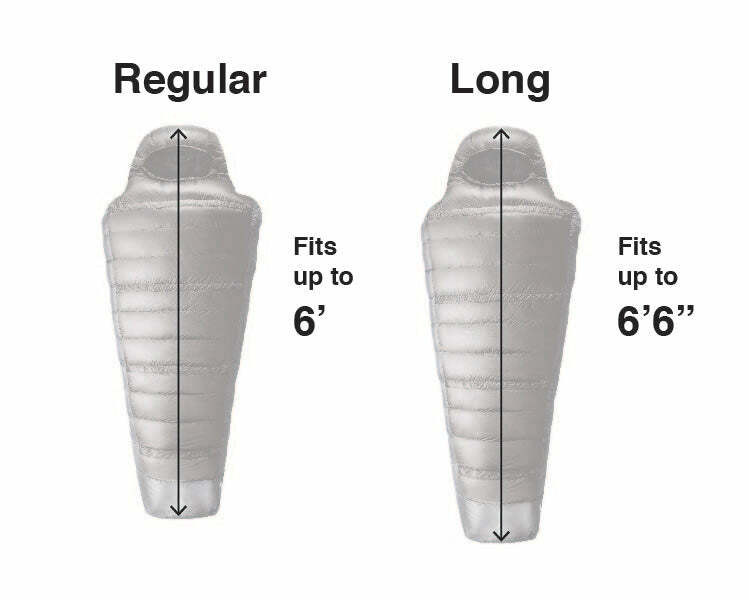 The EN 13537 test standardizes temperature ratings on sleeping bags. * When using the same insulation in the same environment, women generally sleep colder than men. The best guideline for women is the Comfort rating, while the best guideline for men is the Lower Limit rating. Comfort: The temperature at which a standard female can expect to sleep comfortably in a relaxed position. Lower Limit: The temperature at which a standard male can sleep for eight hours in a curled position without waking. Extreme: The minimum temperature at which a standard female can remain for six hours without risk of death from hypothermia (though frostbite is still possible). *These ratings assume the camper is using a sleeping pad, a tent, and is wearing one base layer of long underwear. 78" x 34" / 84" x 34"
Depending on the weather conditions you are camping in, you do not need a liner to use the Thylacine Bag. Our down liner increases your temperature rating by 20ºF, bringing you from a 40ºF bag to a 20ºF bag when using synthetic, or upping the game from a 20ºF bag to a 0ºF bag in a matter of minutes. How does the bag adjust to all conditions? With a removable down liner that can add or takeaway warmth in seconds, this bag is the perfect option when you aren't sure what the weather conditions will be when camping. From 0ºF to 40ºF, the Thylacine has you covered. How do I wash my Thylacine? The performance of this fill (heat retention!) is directly tied to its "loftiness." To help your products retain their loft, please follow our storage and cleaning instructions. Remember: Loft = warmth. Lofty gear = happy you. Keep your sleeping bag in tip-top shape by spot cleaning or hand washing when possible. Hand washing your gear with cold water and Grangers Down Wash + Repel is best for extending its useful life, but it can also be cleaned in a front-load washing machine (do not use a washing machine with an agitator). Zip up the sleeping bag. If the gear is soiled or stained, use the recommended amount of Grangers Down Wash + Repel. Do not use fabric softener, bleach, or stain removal products. Wash the gear by itself using the gentle/cold water setting. Hang to dry, or use the delicate, no heat tumble setting on the dryer with a clean tennis ball, or dryer ball. Do not stuff back in stuff sack damp or wet. How do I store my Thylacine? Where your bag sleeps when you're not sleeping in it affects its lifespan. Before storing after a camping trip, avoid gnarly smells and damaged fill by making sure your gear is completely dry. Then, store lightly stuffed in a large, breathable bag (included with Down Base Bag) or hang in a dry location. This keeps your gear fluffy when stored for extended periods of time. I love this bag. I've slept in it nearly every weekend this summer in the Wyoming mountains in sub-freezing temperatures to mild 60-70 degree weather. The fabric has a luxuriously soft hand and I love that I can make a game-time decision on whether to use the liner to boost warmth or not. Great versatility and sharp-looking design make this a total win for me. This bag is incredible. It has tons of room, yet tightens down to reduce air pockets in cold weather. I've been guiding backpacking trips for over 10 years and this is hands down the best bag I've ever used. It kept me warm when I woke up next to a frozen Nalgene...yet not too warm in the middle of the summer. It's the best all around bag...packs down small, fits different body types, warm and comfortable. Get this bag, you won't regret it.